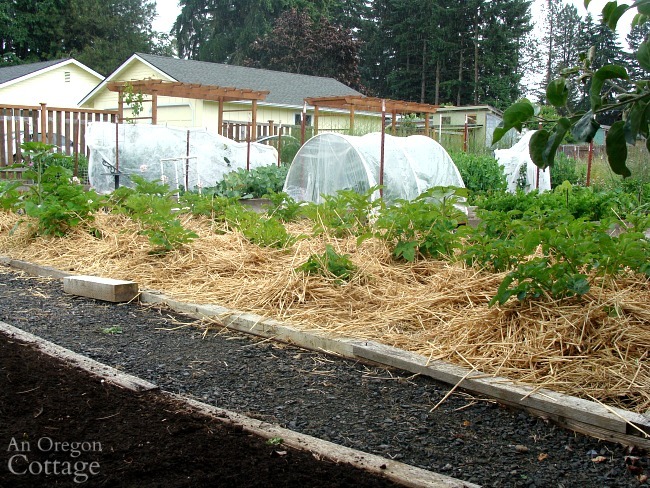 Have you ever thought of planting potatoes with straw? 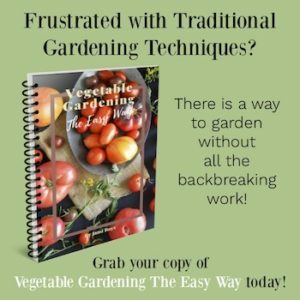 It’s a great way to make planting and hilling up easier, plus harvesting them is fun – and clean – with a lot less wasted to the shovel. Find the how-to along with updates for those who live in damp climates and an alternate way to plant if underground animals are a problem. When I first started growing vegetables, I planted potatoes the most common way I read about: digging a deep hole or trench, laying the tuber in the bottom, and just covering it with soil. As the plants grow, we’re told to add more soil around the base, “hilling up” the plant with soil so that no light could get to the tubers. What happens when potatoes are exposed to light? Potatoes exposed to light turn green, producing a toxin called solanine which we don’t want to ingest in large quantities (this can happen when stored, too, so always store potatoes the dark and cut out any green spots you see – fully green potatoes should be tossed). Those first potatoes grew, producing foliage and flowers, and then eventually started to brown and wither, which meant it was time to harvest – yay! Not so yay: trying to find all the new tubers in mounds of dirt. I started with a shovel. When I realized that more potatoes were pulled up cut in half than not, I moved to a garden fork. Then I had holes in the potatoes. Finally, I just dug around with my hands and a trowel, trying to not miss any. Then I read that potatoes could be hilled up with straw, which would make a cleaner and easier harvest. Um, thank you! Of course I tried it the next season – and not only did it work wonderfully, the harvest was fun and the kids LOVED helping because it was so easy to find the potatoes. It was like potato hide-and-seek, with honors going to those who found the biggest and smallest. They were clean enough that I could store them without doing anything more than curing a bit. If you’d like to experience this, too, follow the easy steps below of my version of “straw-planting” potatoes. I am not an expert, but have planted this way for about four years now, and I have had great success. I’ll never go back to the other way. This bed had black plastic on it to kill the weeds about 2 months before planting (like I described here). When it’s time to plant, remove the plastic and then simply rake up the debris and pull any remaining deep rooted weeds. Wait, when is the best time to plant potatoes? 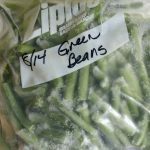 It depends on your gardening zone, of course, but basically 4-6 weeks before your last frost date (click here to see your zone and planting schedule). 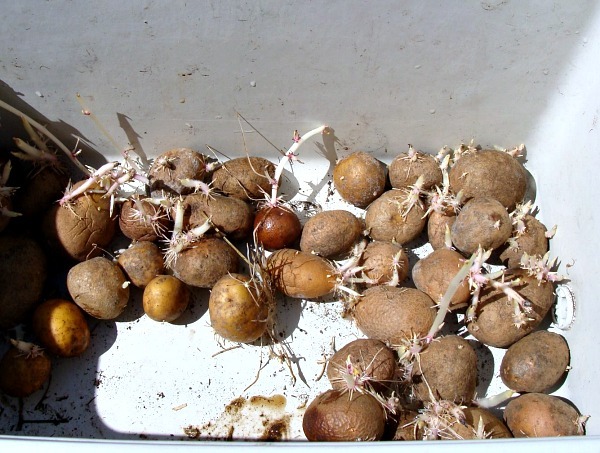 Here in the mild valley of the Pacific NW (zone 8) we can plant the earliest potatoes the end of March and into April (the old saying is St. Patrick’s Day, but I find that to be to wet, even with a no-till raised bed). We can also keep planting potatoes into June, using the earliest maturing varieties for those planted the latest. TIP: You can just see the bed in the top of the picture above where I grew the previous year’s potatoes. Which reminds me that another benefit of growing potatoes with straw is keeping the weeds down all year! I simply leave the straw in place after harvesting until I need to plant the bed the next spring. Love it! Buy certified disease free seed potatoes. 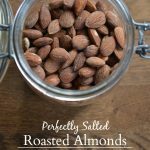 I regularly purchase from my favorite catalogs, Pinetree Garden Seeds (click to get $5 off your first order), Territorial Seeds, and Nichol’s Garden Seeds. You can also find seed potatoes at garden centers and nurseries in early spring. Take a chance on store bought potatoes that have sprouted or leftover potatoes from last year’s harvest. I decided to use the last of my stored potatoes that had already sprouted (some gardeners always presprout potatoes before planting). That year we had eaten the last of the good potatoes on April 4 (a record!) that I had stored through the winter like this for a total of 7 months. That remains the longest ever, so it was a very good year. Yukon Gold, an early yellow potato. Red Norland, early to mid-season. A Russet-type late season potato. There are lots of fun types of potatoes – try growing something that you can’t find in the store if you have limited space, like fingerling. 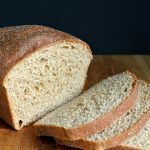 What was the result of using the previous year’s sprouted potatoes? Well, planting leftover potatoes was an experiment. And I didn’t have a good crop that year, so I’m thinking it was because they weren’t “certified disease free” seed potatoes. That, plus the fact that I haven’t had any leftover potatoes, means I’m back to buying the seed potatoes. After the bed is prepped and the potatoes bought, head to the garden, take your shovel and mark where you want the potatoes planted by digging about a 4 inch hole in the soil. Space the hills about 2 feet apart in all directions. I like to plant in alternating rows. What if my soil isn’t that great? 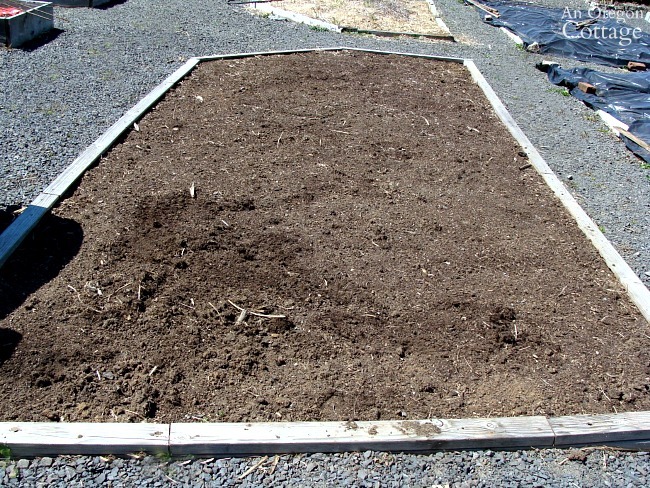 Use the steps outlined in how to plant a no-till garden bed: after raking the debris, add a complete layer of good quality garden compost to the bed. Then mark your holes and dig a bit, mixing the compost with the soil as you dig. 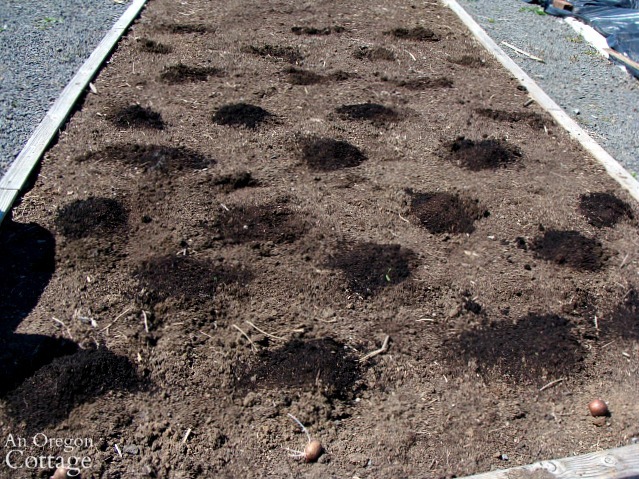 Mix the soil and compost together a bit, and place a spud in the hole/indentation you’ve dug. TIP #1: I usually use small, whole potatoes to lessen the possibility of rotting (it’s known to get damp here in the Pacific NW, ha! ), but I’ve used cut and cured pieces as well with good results. TIP #2: Lay them all out before covering them up, so you can see where they are and don’t inadvertently step on one (not that I’ve ever done anything like that…). 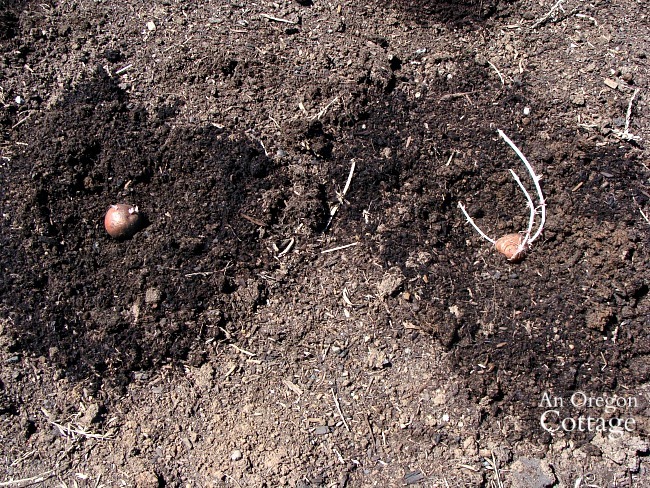 Cover up the tubers with the soil, making a slight mound with your hands. If there are long sprouts like mine, don’t bother covering them, they will be covered by the straw later. Just be careful with them and try not to break any of the sprouts. Though you probably won’t have sprouts this long even with presprouting – I think I should’ve planted sooner that year! After mounding all the potatoes with dirt, cover each seed potato area with straw. The straw flakes off in “leaves” (seen above on top of the wheelbarrow) and these can be pretty dense, so you’ll need to separate them so that the straw is light and relatively fluffy to allow the stems of the potato plants to grow through. 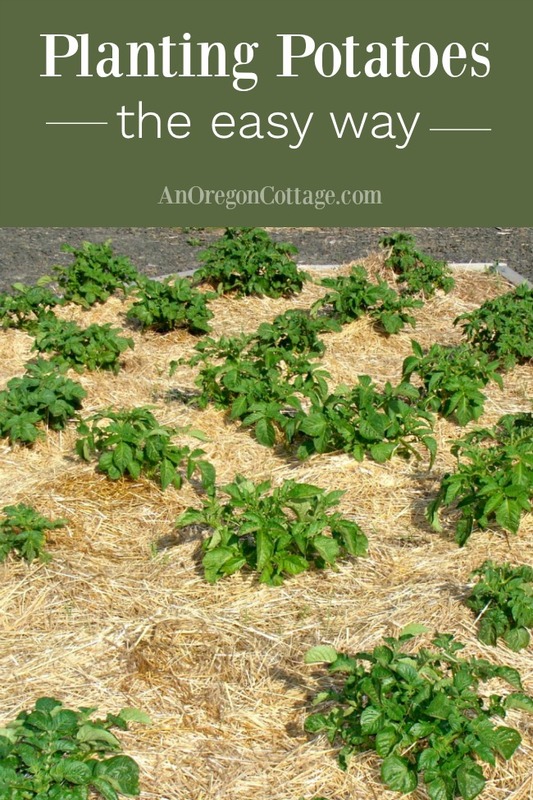 This is easiest with dry straw so if you get the straw awhile before planting, keep it covered. TIP: It’s important to use straw, NOT hay, as hay will have many more seeds that will sprout into weeds…not something we’re after here! I learned this lesson after one time buying a neighbor’s “straw” that ended up being rotted hay, so now I just buy a bale from the feed store now. For this large bed, I used about half the bale for the first mounds, leaving the rest for hilling up after the plants have grown. At about $9 a bale, I think it’s worth it. Keep going until all the potatoes are covered in a straw mound, and as you’re doing that, lightly cover the dirt between the mounds to help keep weeds down. If it’s not going to rain for a few days, I water the mounds either by hand or with a sprinkler. It also helps to keep the straw in place if it’s particularly windy. 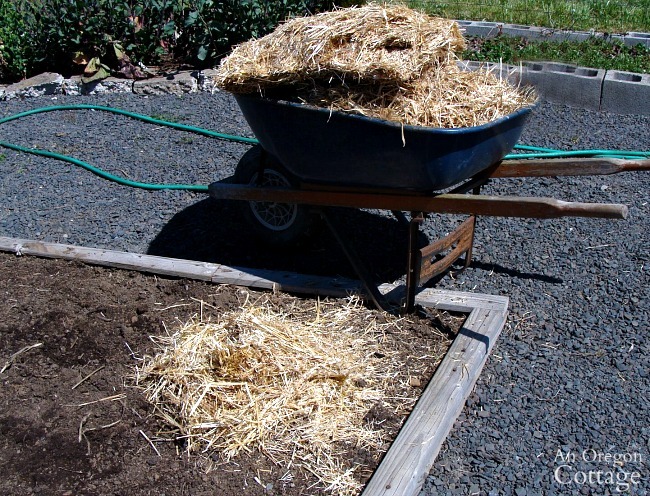 When the stems of the plants are about 6-10 inches above the current straw mounds, put another layer of straw on them, making sure they are evenly covered all around the base of the plant. The plants shown above are in June and have been hilled up twice. I usually add the straw around the edges, pushing the plant together in the middle with my hands. If there is a bare spot in the middle of the leaves, I’ll add straw there, too. Just make sure they are covered fully. How do you care for them throughout the season? Other than hilling up with the straw I usually don’t do anything else – they are pretty easy! During the growing season, water weekly if you don’t have rain up until the plants are still flowering. 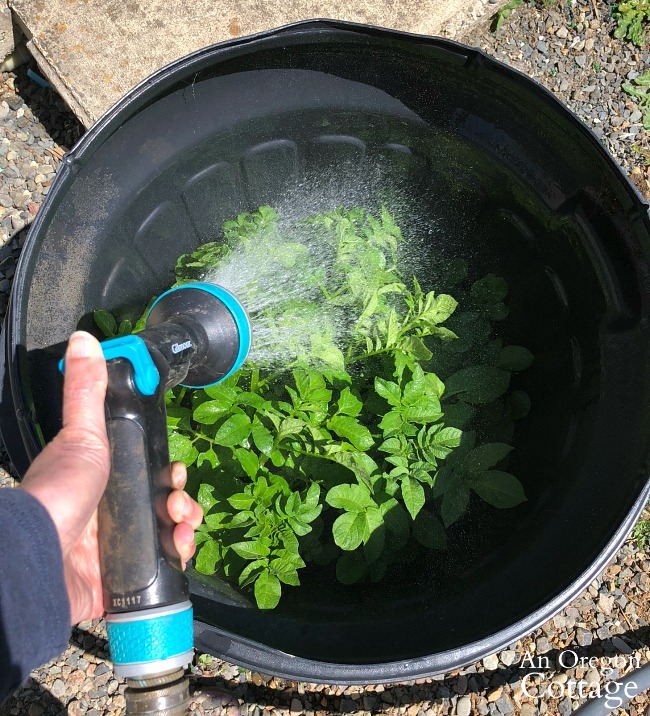 Stop watering as much as the flowers fade to toughen the potatoes for harvest. 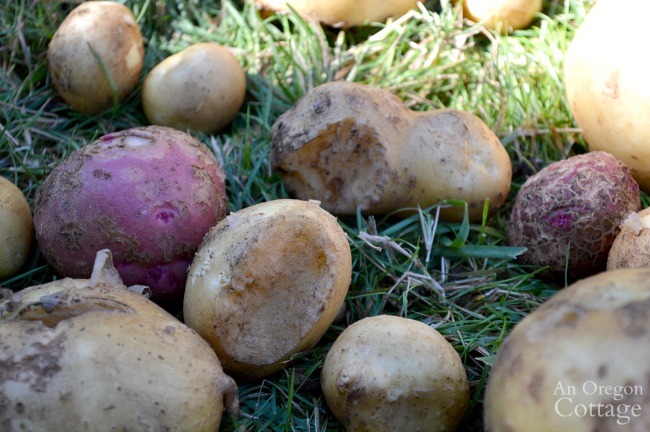 When can you harvest potatoes? New Potatoes: As soon as you see flowers, you can pull back some areas of straw and harvest “new” potatoes, carefully covering back up with straw. 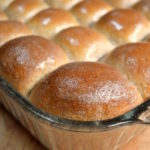 These are usually ready the same time as the peas, which is why creamed peas and new potatoes are such a treat! Main Crop: When the tops brown, wither and/or die back you can harvest all the potatoes you see. Go here to see how I harvest potatoes and here to see how I store them. I firmly believe that we, as gardeners, should be open to change. It’s OK to have a method that you love, but if the weather doesn’t cooperate, the bugs attack, or the harvest just isn’t what it should be, a little tweaking is in order. And in the fifth year of using this method with success as is, my crop was devastated by slugs. While the benefits of mulching are numerous (suppresses weeds, holds in moisture, keeps soil from eroding, to name a few), the one drawback where there is moisture is that it provides a nice place for slugs to hang out. By the hundreds – or millions like it sometimes seems. Since they also weakened the plants, it gave a foothold to flea beetles, too, so some tweaking was definitely needed. 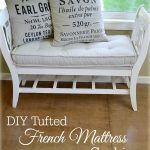 If you live in a wet climate like the Pacific NW, you may find this adjusted technique helpful, too. Dig holes a little deeper (6 inches instead of 4). Mound dirt a little higher. 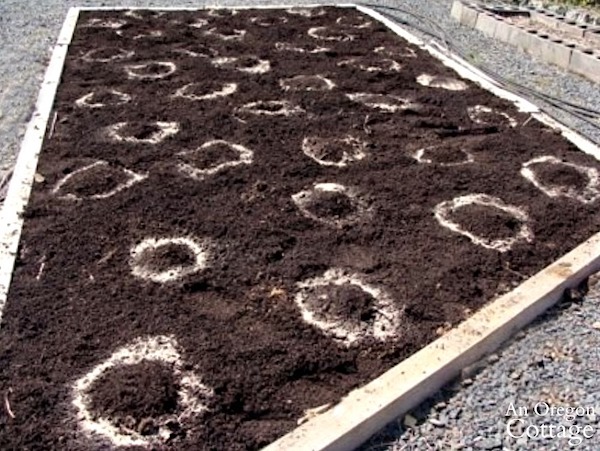 Circle each mound completely with organic slug bait or diatomaceous earth. Here’s the big difference: Do NOT add any straw until the plants have grown 6 to 8 inches tall. This allows the tender shoots to grow without providing cover for the slugs. When plants are 6-8 inches tall, start hilling up with straw like normal. This worked really well, so if slugs or snails are a problem, this is your method! I continued to plant and grow potatoes with this method, but over the next few years the vole population (aka, field mice) grew out of control. It seemed like I was growing the potatoes for them – there was hardly a potato that didn’t have some vole damage on it. Growing potatoes in a clean, unused garbage can. And it worked well – I just can’t get as many potatoes from these small bins, of course. With cans, you can plant in dirt at the bottom and hill up with straw like the beds. You’ll just need to water more often because they dry out quicker like all container grown plants. Use a drill with a large bit to add drainage holes to the bottom of your clean garbage can. 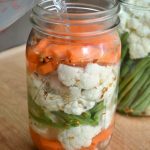 Fill the bottom third of the can with a mix of quality soil and compost. Plant seed potatoes into this mix, burying about 4 inches down. Water and wait for sprouts to appear. Hill up with more straw (or soil) when plants are 8 to 10 inches, continuing to hill up as they grow. Water a couple times a week if there isn’t any rain. Harvesting new potatoes is harder to do without damaging the remaining tubers, so I usually wait for the tops to brown before harvesting. You can dump the can onto a compost pile and pull out the potatoes. So these are all the ways I’ve planted potatoes the easy way with straw – I’d love to know if you’ve had any experience with this method, how it’s worked for you and if you’ve made any tweaks to it like I have. This article has been updated – it was originally published April 2009. Subscribe & Make This Year's Garden A Success! Welcome - so glad you've joined the AOC community! Your first step is to check your email to confirm your subscription. i SO want to do this! 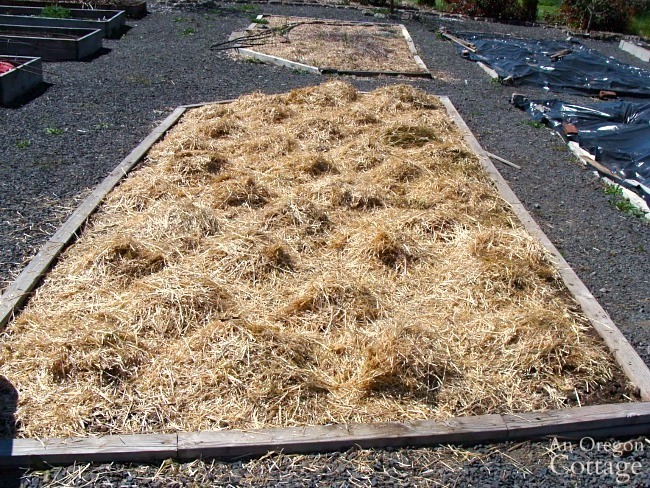 do you have a photo of the bed after you have covered the PLANTS with straw? are they covered completely so you cant see them? or like in the picture above with the plants still sticking out? I don’t cover the plants completely, Jennifer – you still want the top leaves to show to get sun, etc. to grow. You push the straw up around the sides and only down in the middles if you see light might be getting in. I did them in straw only and did decent enough to feed several mice families GRR. I dont know if voles are the same as moles and gophers. I have moles and gophers. I have used a product successfully from gardens alive.. https://www.gardensalive.com/?p=0172187&utm_medium=cpc&utm_source=google&gclid=CjwKCAiAqIHTBRAVEiwA6TgJw3jwraH6dUkpDWu-PAOYer67zIMVAM_DdCusxohi5IFfJ7grB_a78xoCuCAQAvD_BwE. It’s called Mole-Relief™ Dry Repellant. I’ve used it for ten plus years. It’s not a quick fix but if yu use it year after year you will run them off. I’ve used it in already planted gardens and that doesn’t work. Has to be used on areas before being planted until you are rid of them. Potatoes and dahalia bulbs are to tasty for them to leave behind I think Anyway.. this stuff works.. just give it time. I sprinkle it directly onto the holes. To exspensive to spread over two acres. I live on oregon coast. I’d start putting a spoon full in the mounds as soon as you move in. Get them running.. especially if your buying this place. I wish I had a before picture of my yard. It was covered when we bought our home 6 years ago. At the end of summer a couple start appearing again but i always give them a dose of the mole relief and it works pretty well. I’ve been super pleased with it compared to all the stupid retail stuff at the store. I have a big yard too. Just start by your house and garden and work out . Also gardens alive has a coupon every spring half off 50$ . Stock up then everyyear Good luck..
You give me hope, Peg – I’m doing this for sure, thank you!! A friend told had problems with voles and told me to use something like 1 tbsp castor oil to a gallon of water and water it in. He said to repeat every 8 months but he hasn’t needed to. Last year, the voles ate more than half of my potatoes! Of course they don’t eat the little ones that are a pain to wash, no, they half ate the big ones! So disappointing. I planted some in kiddie pools placed on top of pallets and didn’t have any problems with voles in those. I made sure to keep the plants from hanging over the sides so the little buggers couldn’t get in. 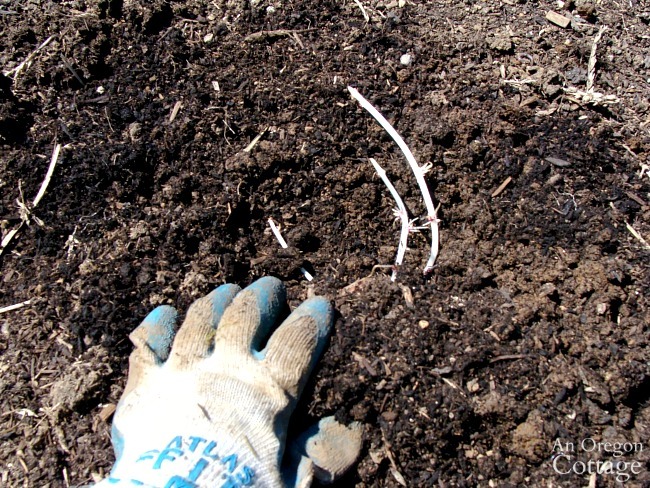 Did you put bonemeal in the soil while building the soil or while planting your potatoes? I plain to try your method with the castor oil. I totally gave up last year, Michelle, and didn’t plant any potatoes at all. 🙁 I was tired of doing all that work for the voles. And yes – bites out of nice, big potatoes, which means you can’t store them. Yuk. I tried so many things, but I didn’t try the castor oil. Hmmm, I wonder if it’s okay on the soil and other plants? I’ll have to research it a bit! Thanks for the suggestion and let me know how it works for you if you try it! My husband and I moved into a home that has 3 raised vegie beds. 1 potatoes, 1 strawberries and the other misc; rubarb, sage, onions etc. I haven’t done much but harvest potatoes (here and there) so there are plenty of potatoes and seeds still in the bed continuing to grow season to season. 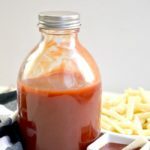 I’ve just been researching how to grow and harvest potatoes and love the cleaner straw method and want to do so in a barrel for an even easier harvest. But, it sounds like it’s time to clean out this bed, harvest and store all the potatoes and plant a winter crop of something. What would you suggest for the winter crop? Can I store the seedlings for next years planting AND what to do with those that have risen to the top of the bed and have green areas? Are they toxic? or just taste bad? What a great inheritance, Nina – a house and some fresh food! Some sort of legume like fava beans would be a great cover crop that would replenish the soil. 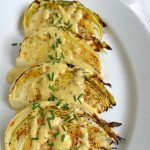 The potatoes with green areas should taste just the same – just remove any green parts, as those specific parts are toxic (though you’d have to eat a LOT of them for any problems to occur…). I’m going to try planting potatoes in a trash can next year to thwart the voles that ate most of our crops the last two years. 🙁 We’ll see how it goes! So am I right? I should pull all the potatoes? A couple tips for slugs. Coffee ground! Caffeine is a neurotoxin to slugs. It kills them. Think about it…..something so slow-moving being given caffeine??? Anyway, also use epsom salts for fertilizer. Compost tea is always nice too but if you don’ have it standard fertilizer is fine. Epsom salts puts Magnesium into the soil.. Once a month is fine. Potatoes are easy to grow. As long as the tyubers don’t get any light, they’l do fine. Also, put ceyanne/chili pepper around or on your plants to keep bugs away. It’ll also keep squirrels away. Doesn’t bother the birds tho. Such great tips, Tom – thanks! I’ll definitely use the coffee and I do use epsom salts occasionally in the garden. How late can I plant potatoes here in Oregon City? I would think you can plant up through June – but the later you plant, the earlier the potato should mature. So, Yukon Golds are earlies that would mature in time for a Sept. harvest, but Russets are late, so they’d need to be planted earlier. I have read that if the potato sprouts are long, you can trim them back a bit. I don’t think it’s a big deal if they break, though it might not be good if the entire thing breaks off. Not sure about that one, but trimming should be fine. 🙂 Your blog is an interesting one, I’m learning! Very interesting! I love growing potatoes, but was not planning on it this year as I won’t be able to do so much digging this season. But now I’m rethinking it… Looks so easy to do what you’re doing! I might give it a try. A question: Is this the only year you’ve had a problem with mice, or is that common with this much straw? Seems like it would give a good home for them, plus a late night snack as well. Curious how it’s gone the other years you’ve tried it. Thanks for posting this! 2009 was our worst year for voles- the past couple have not been as bad. I have had problems with slugs, though- eating the new shoots under cover of the straw. 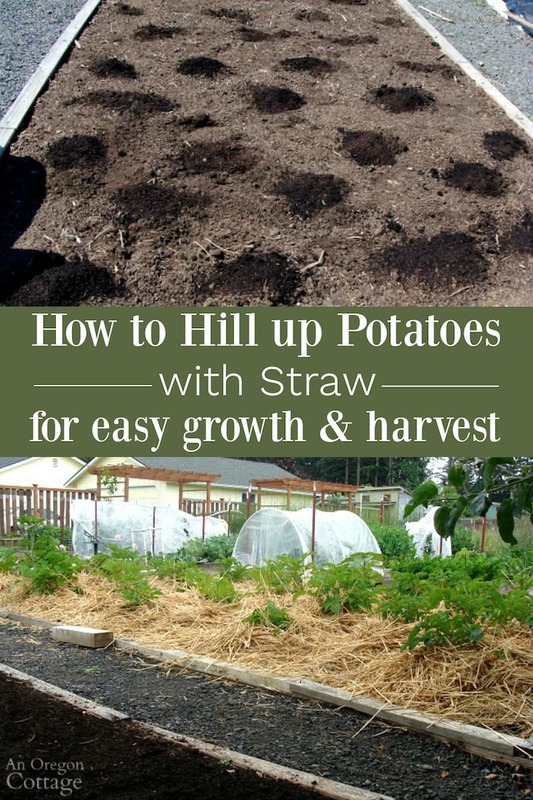 So now I start the potatoes about 3-4 inches under ground, let them grow to about 8-10 inches (nice and sturdy) and then hill-up with the straw (I’m adding a link in this post to the one I wrote on this today!). Elizabeth- the plants will pop through- that’s OK. You want the leaves to get sun, etc., just not the tubers (sun turns them green). I probably cover the bottom foot and a half with the straw, then just push the straw closer around the plant as it grows and the straw moves. Thanks for this info! I’ve put straw over my potatoes and the plants keep popping through- is it important to keep them covered? Or just the base around the plants? David- What a great story, I actually had no idea how long people have been doing this. Thanks for sharing! This is great! When I was a young boy i would visit my grandfather’s farm in Ohio, and this is where I first was exposed to this growing method. His neighbor, Andy, grew and sold vegetables and berries, and I remember him showing me this method and how clean and perfect his crop of potatoes were. As he told the story, he learned this method when he was in France in WWI. He brought the method home to Ohio and used it with great success until his death. He was so successful, professors from Ohio State would bring their classes to his small farm to see and study his methods and fabulous results. I think we used to pay him a quarter or two for a pint of berries. Those were the days. Glad you’re reading way down in Australia! One question though, isn’t it fall down there? Is your climate one where you grow potatoes in the fall? Jami hello from Australia,I absolutly love what you’ve set up here.Everything is easy to read and easy to follow step by step pictures,ecspecally your recipes.This will be my weekend project planting my own potatoes.